When boxing great Floyd Mayweather was interviewed by sports and entertainment media earlier this week and was asked about his erstwhile competitor Conor McGregor, the undefeated boxing champion only had good words for the UFC superstar. 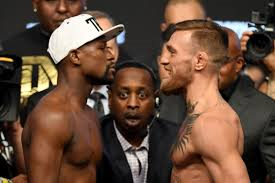 Mayweather also complimented McGregor for being a “warrior.” The boxing superstar even invited McGregor to train for the Khabib fight at the Mayweather Boxing Club in Vegas. Mayweather swiftly dropped his reconciliatory tone presumably after he learned of McGregor’s hostile responses. He took to Twitter to make a swipe against McGregor. Mayweather posted a picture from their fight and wrote: “Easiest 9 figures I ever made!" Do the two fighters really despise each other that bad, or are they just prepping their audience for a possible rematch in the ring?